Stunning backs are an ever growing trend in modern wedding gowns. 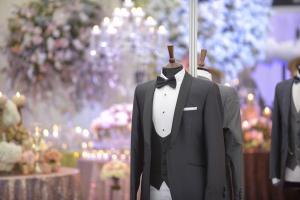 With your back turned to your guests for most of the wedding, brides love to have an intricate and beautiful design to accentuate the back as well as the front, wowing both their guests and their future partner. Lace is a truly classic look for bridal gowns. Heading into 2016 wedding boutiques are seeing ever growing popularity of using lace with a modern twist; delicate lace sleeves, full lace dresses in washed shades of blush and sky blue, and even three dimensional lace with lots of texture, layering and fringing. For 2016 the alternative trend to surface texture has become the classical smooth lines of Satin and firm Mikados. Silk Mikado is ideal for giving bridal dresses fantastic structure. Heavier than regular silk, Mikado is a great choice for wedding dress designs with clean lines. Ideal for brides choosing more minimalistic weddings. Groomswear is seeing a swing back to traditional outfits for 2016. Formal tails making a strong comeback for the New Year and will see the popularity of lounge suits dramatically falling. Grooms are heading back to sleek sophisticated cravats rather than choosing standard ties. Popular colours will however remain within Charcoal Grey, Navy and Black. I'm going for something with a more intricate back too! I love the thought of people seeing the front, and saying oooo isn't it nice, then turning round and them being even more impressed with the back. I'm also making sure I'm angled showing the back of my dress on some of my photos too.